My kit has a copyright date of 1997. The kit has been issued in 2007 by Zvezda, minus the figures. 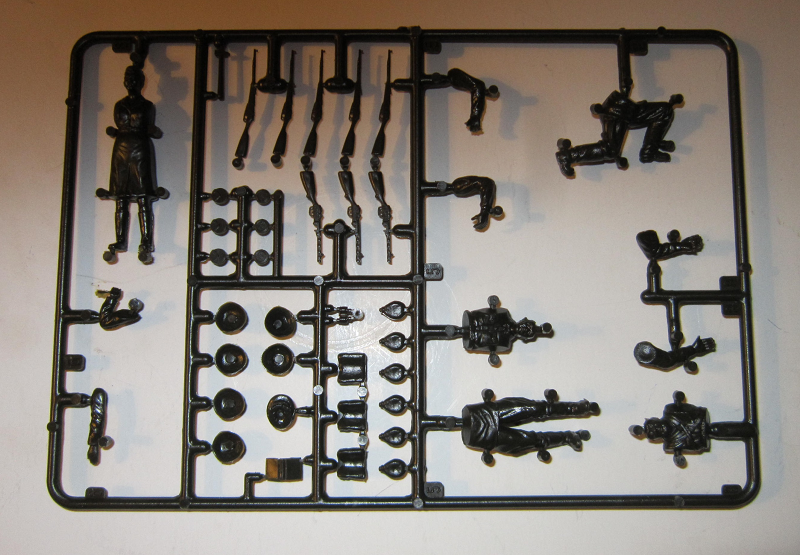 It is available at 6 shops overseas or at Mega Hobby for $16.49, Kit Linx for $16.69 or Sprue Bros for $15.49. The 122 mm howitzer M1938 (M-30) was a Soviet 121.92 mm (4.8 inch) howitzer. The weapon was developed by the design bureau of Motovilikha Plants, headed by F. F. Petrov, in the late 1930's, and was in production from 1939 to 1955. The M-30 saw action in World War II, mainly as a divisional artillery piece of the Red Army (RKKA). Captured guns were also employed later in the conflict by the German Wehrmacht and the Finnish Army. Post World War II the M-30 saw combat in numerous conflicts of the mid- to late twentieth century in service of other countries' armies, notably in the Middle East. Italeri is a old prolific model company based in Italy. They manufacture all manner of model subjects in the popular scales. The kit comes in shrink-wrapped end opening type box. I am no fan of this type of box, because invariably parts or the decal sheet find their way past one of the end flaps to become lost forever. Give me a tray and lid type box any day of the week. 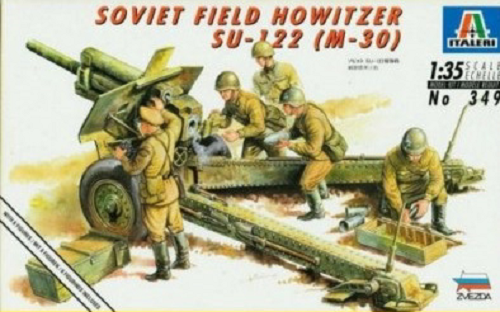 The box art shows the SU-122 (M-30) howitzer posed against an all-white background. Similar to how Tamiya does the majority of their box arts also. It shows the gun as overall dark-green with a 5-man crew all in khaki uniforms and black jack boots. Four men wear steel helmets and an officer wears a cloth billed hat. He is holding a pair of binoculars and has his right arm raised. Three men are loading the gun and fourth man is kneeling on one knee and unpacking a powder charge from a wood case. There is another wood ammo case laying next to the gun. One side panel has a one-paragraph history of the howitzer in 7 languages, including English. Each language is marked with a color illustration of the flag of the country that speaks that language. The other side panel has the history in 4 more languages with the flag illustrations. 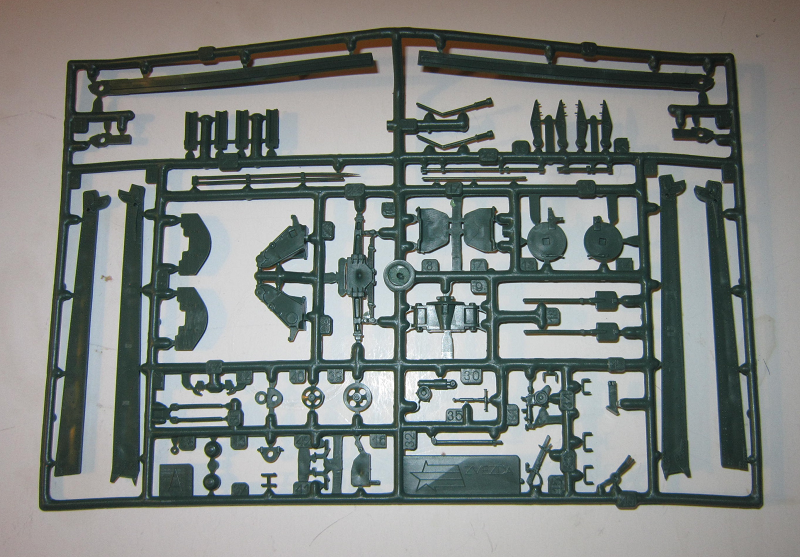 The kit is for modelers age 10 and older and not suitable for children under 3. Model Master brand paint colors are suggested to use. The kit contains 4 dark-green trees in 2 sealed clear cello bags and the instructions. The instructions consist of a single-sheet that accordion-folds out into 6 pages in 5 1/4" x 8" page format. Page 1 has the history of the howitzer in 9 languages, including English. Page 2 begins with ATTENTIONS about the kit in 10 languages, over general instruction and international assembly symbol explanations. Page 3 through 5 gives 6 assembly steps for the howitzer. 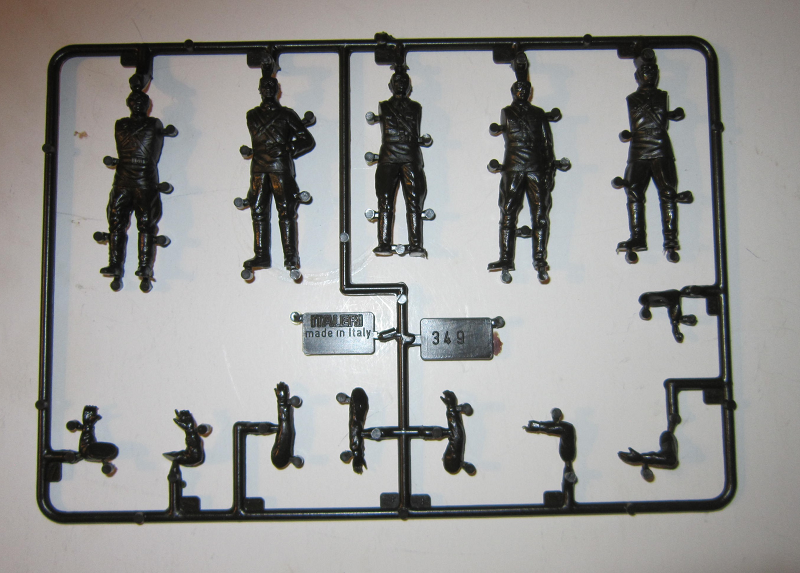 Page 6 has an un-numbered step for assembly of the 8 figures. Trees are alphabetized, but not all illustrated in the instructions. The two trees of the crew figures are not alphabetized. Trees all have part number tabs next to the parts on them. Dark-green letter A tree holds: recoil arms, control wheels and levers etc. (60 parts) This tree has Zvezda brand molded on it in raised letters. 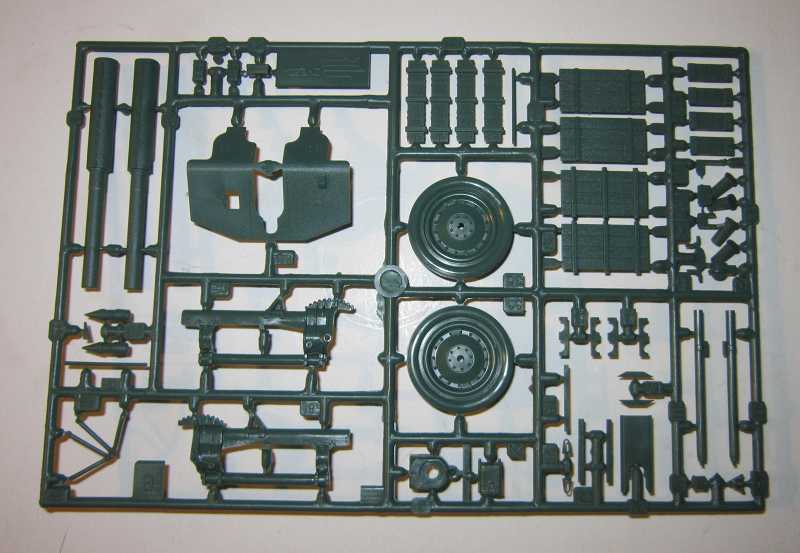 Dark-green letter B tree holds: gun parts, wheels, axle, shield, wood ammo crates, shells, powder charges and warheads etc. (55 parts) Again this tree has Zvezda molded on it. ​The first very dark-green tree of figures holds: one standing male figure, the female, and a kneeling male. The standing and kneeling males are divided into torso, lower body and separate arms. The female is divided into full body and separate arms. There are no decals in the kit, as this gun did not carry any marks. There is a slip in the kit that says the kit was made in Russia by Zvezda and imported by Italeri in Bologna, Italy. Nice overall molding and detail.